Commonly known as the Japanese banana, Musa basjoo is a popular ornamental herbaceous perennial with trunk-like pseudostems. Although originating from southern China, it was first discovered for western science on the Japanese islands of Ryukyu - hence the common name. 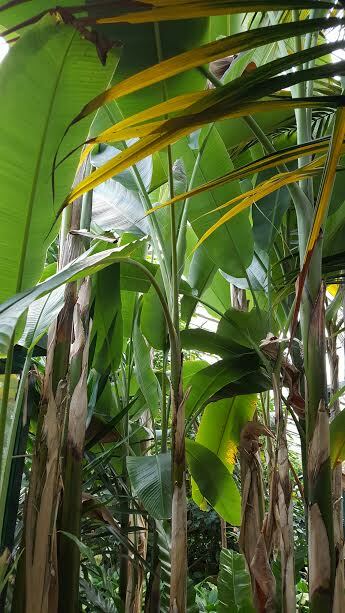 Under favourable conditions you can expect Musa basjoo to grow to approximately 2–2.5 metres tall. The mid-green, paddle-shaped leaves can be up to 2 metres long and 70cm wide once mature. This species is monoecious meaning that it produces male and female flowers on the same arching inflorescence (flower head). The inflorescence can extend from the pseudostems for over 1 metre. 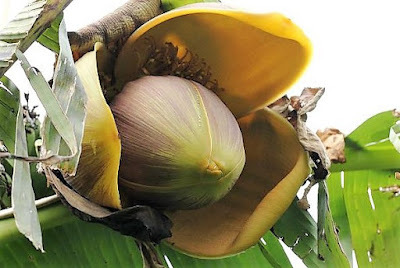 The banana fruit formed are yellow-green, around 5–10 cm (2.0–3.9 in) long and 2–3 cm (0.79–1.18 in) broad; they are inedible, with sparse white pulp and many black seeds. Of the approximately 70 species of banana within the genus Musa, Musa basjoo has proven to the hardiest. So much so that it can be left outside with minimal cold protection in the milder regions of the UK. The roots are proven to be surprisingly frost hardy and able to withstand temperatures as low as −10 °C! The exposed pseudostems will suffer damage once temperatures go below few degrees below freezing, so it is always advisable to protect them with a 'breathable' insulation such as straw secured within a wire frame or multiple layers of fleece. Bubble wrap isn't really suitable as condensation can build up within the wrapping, increasing the incidence of fungal rots. If the pseudostem is killed, the banana will resprout from the ground in the following spring when it can grow rapidly grows to full size in a season. To allow the plant to make the most of the growing season and establish a decent sized root system before the winter plant as soon as the threat of late frost has passed in late spring. To prevent leaves being being shredded, choose a sheltered site protected from strong winds. If possible, position Musa basjoo on a site which slopes away slightly from the plant to help avoid planting it in a frost pocket. Musa basjoo will perform best when planted in a well-drained soil, previously enriched with organic matter such as well-rotted farm manures or garden composts. They require full sun, and over the growing season may be watered and feed generously to achieve the best foliage. Under favourable conditions, specimens grown in mediterranean and subtropical regions can expect Musa basjoo to come into bloom from 12–24 months. It is not unknown for them to flower in the UK in exceptionally mild years. Unfortunately the subsequent yellow-green fruits are inedible.